Using the technical media of analogue and digital imaging, the installation explores the relation of original and copy. The piece makes a digital scan of a single point in the image produced by this camera obscura, simultaneously reconstructing it in the Barcsay Hall, thus extending, duplicating it. The silhouette of the scanning device is faintly visible on the matte glass of the pinhole camera, obscuring the scanned point. The spectator can estimate the missing ‘pixel’ from the live image of Andrássy road around the device, the digital copy of which pixel is reproduced on site by a colour LED. 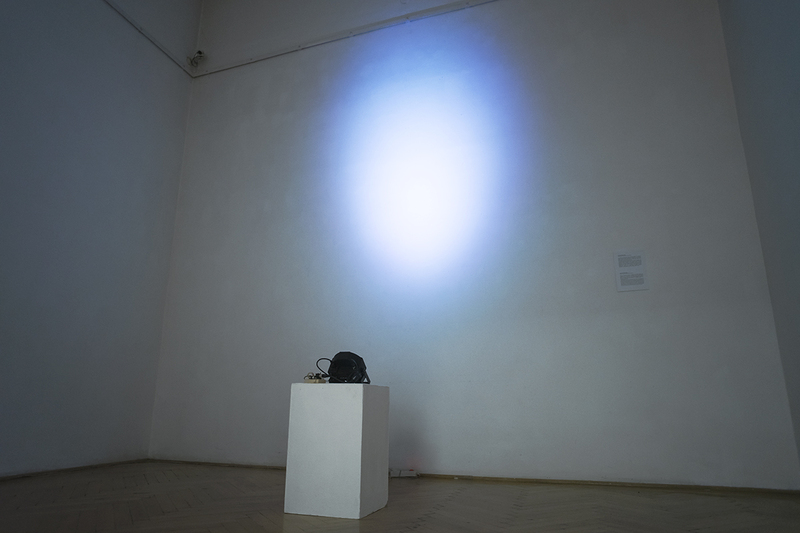 The signal is transformed into a colour code which is then transmitted from here into a room of the exhibition, where the other half of the installation, a lamp displays the real-time colour data, extending the colour of a particular pixel of the scanned image into the space.